Most numerical models suggest that historical ocean physical and biogeochemical trends observed over the last several decades will continue at least through the middle of this century, and the trends may even accelerate in response to growing human population levels and, more importantly, rising economic standards of living, particularly in the developing world. For the last decade for which data are available (2002–2011), fossil fuel emissions averaged 8.3 ± 0.4 billion metric tons of carbon per year (uncertainty is ± 1 standard deviation in estimate of decadal mean). Over the same time period, fossil fuel emissions grew with time at a rate of 3.1% per year since the year 2000. Deforestation and land-use change accounted for an additional source of 1.0 ± 0.5 billion metric tons of carbon per year. Once released to the air, these greenhouse gases persist in the atmosphere for years to decades or longer, and the climatic impact of past and current human greenhouse gas emissions are global in extent and will be with us for a long time to come. The phenomenon of global warming should, more appropriately, be called ocean warming, as more than 80% of the added heat resides in the ocean. Direct measurements of ocean temperatures show warming beginning in about 1970 down to at least 700 m, with stronger warming near the surface leading to increased thermal stratification (or layering) of the water column over much of the global ocean. Deep ocean temperatures are also on the rise. Doney, S.C., Bopp, L., and Long, M.C. Oceanography 27, 108–119 (2014). It is too early to draw firm conclusions on the net effect, but it is rather clear that ocean acidification will affect marine organisms and will cause change. 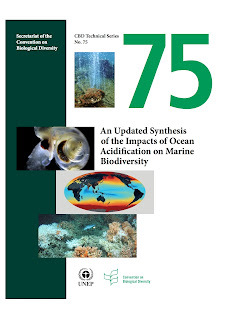 While ocean acidification has been recognized as a topic of high research priority leading to a crescendo of studies, deoxygenation has not reached that level of recognition. But what is really missing is the joint perspective, where the full and synergistic effect of all three stressors acting at the same time is investigated. Nicolas Gruber, Phil. Trans. R. Soc. A 369, 1980–1996 (2011). Unless both groups take concerted action, stabilizing the climate will be impossible. As economies mature, they become more efficient. But this improvement in energy intensity has not been fast enough to offset the overall effect of growing economies. Current international policy approaches, which ignore trade, create strong incentives for countries to sit outside climate agreements and to take a free ride on benefits, not only in terms of climate change mitigation but also because of industry relocation. 「Getting serious about categorizing countries」Science 345, 34–36 (4 July 2014). …potential benefits need to be weighed against the time and effort expended and the real risks of feeling under attack. Additional recognition of the value and importance of such activities among academic employers would also help. T e challenge is to embrace the complexity of the situation, to acknowledge the uncertainty and the nuance, to welcome questions and investigation and show the process of climate science in good health. Online engagement would seem to be essential in this endeavour. After our fossil fuel blow-out, how long will the CO2 hangover last? And what about the global fever that comes along with it? According to Status of Coral Reefs of the World: 2008, a synthesis report by hundreds of scientists and environmental managers, 19% of the world’s coral reefs have been lost since 1950 and another 35% are threatened or in critical condition. Their analyses suggest that corals can ‘toughen up’ over the course of their lifetimes in response to environmental conditions. A final, important piece of the puzzle is the corals’ symbiotic algae: these are shorter-lived and faster-evolving than their hosts, and research has shown that they can pass along thermal tolerance. In the meantime, the world’s output of carbon dioxide and other heat-trapping gases has continued to rise. The level of CO2 in the atmosphere reached 396 parts per million in 2013, 42% higher than pre-industrial levels. Last year’s was the largest annual increase since 1984, according to figures reported on 9 September by the World Meteorological Organization in Geneva, Switzerland. The challenge is formidable, says Nicholas Stern, a climate-change economist at the London School of Economics. By 2030, Stern says, the world must reduce its greenhouse-gas emissions by roughly 20% from the current level to have a chance of limiting warming to 2 °C above pre-industrial temperatures, the UNFCCC’s stated goal. Current emissions pledges put the world on track for a 3 °C warming by 2100, according to a 7 September report by PriceWaterhouseCoopers.